Getting scanned is convenient and easy. Simply stand on the turntable and hold still for 30 seconds while the platform spins. You’ll receive 21 custom measurements and a razor-sharp high-resolution image that we can track and compare over time. A scan is non-invasive and harmless. Our robust feature recognition algorithms recognize key landmarks on a person’s body and use them to extract highly precise body surface measurements. 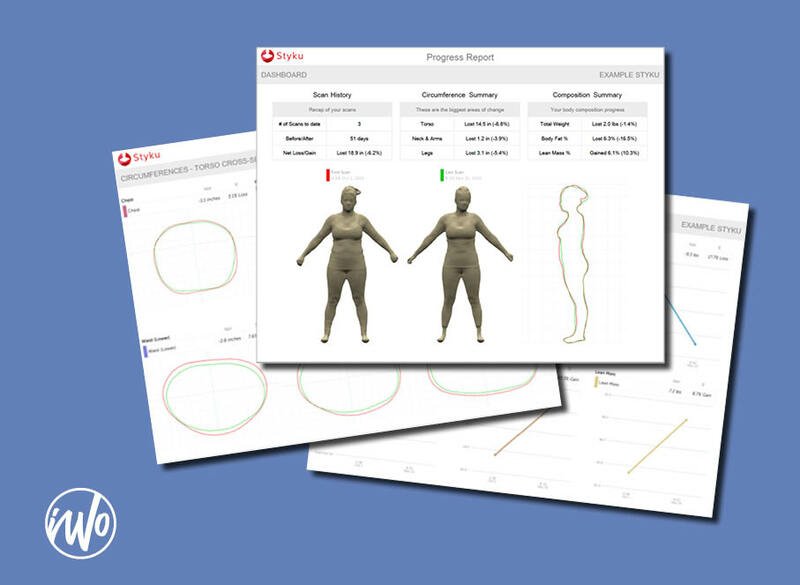 You can rotate, pan, and zoom a full body model to analyze your profile, silhouette, and waist to hip ratio. Information can be viewed in 3D, tracked and compared through multiple scans. We have the capability to extract hundreds of measurements throughout the body and our software will chart your key measurements over time, as well as calculate and track where you’ve gained or lost inches along your health and fitness journey. At It’s Working Out, we can enter values to track fitness, body fat and health goals. We can help you set goal dates and establish a program using your personal scan data via a personal training session. Choose from a single scan, or for only $10 more get 2 scans so you can track your progress. Once you’ve purchased a scan package, click here to schedule.